Lasers have already had a profound impact on our daily lives but the potential of the technology has only just been tapped, scientists believe. Sunday marks the 50th anniversary of the first demonstration of a ruby laser at the Hughes Research Labs in the US. The light beams have since found myriad uses, from scanning shop prices to trying to sense the ripples in space-time made by colliding black holes. Researchers say the coming decades will see even more remarkable progress. "The laser gave a capability over previous light sources that was just so immense that you simply can't digest and exhaust all that in the matter of a few decades," said David Hanna, emeritus professor at the Optoelectronics Research Centre, University of Southampton, UK. "People have to use their imagination about what amazing and crazy things can be done with all that capability," he told BBC News. There is debate over which key technological step made the laser possible, but Theodore Maiman's success in stimulating a ruby rod to produce an intense narrow beam of light by shining a flash lamp on it was an undoubted landmark. There had been a race to demonstrate "light amplification by stimulated emission of radiation" (Laser), and Maiman beat everyone to it on 16 May, 1960. At the time, the technology was said to be the classic "solution looking for a problem", but its ability to direct a powerful stream of energy from one location to another soon opened up a world of possibilities. Anyone who scans a tin of beans at the checkout is using a laser. Anyone who listens to music on a CD is using a laser to read data stored on a disc. Anyone who sends an e-mail is reliant on the lasers that drive the world's fibre optic communications networks. Anyone who gets into a car is sitting in a box that owes its construction to lasers. 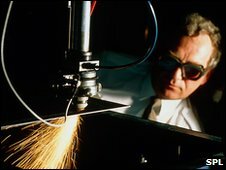 "There is a phenomenal amount of laser processing on a car; you wouldn't believe how much - laser cutting, marking, measurement, drilling, hardening, laser brazing, laser deposition, and laser welding," explained Tim Holt, the chief executive of the Institute of Photonics, University of Strathclyde. "Modern cars today would not be possible without lasers." The worldwide market in lasers is worth some $5-7bn annually. 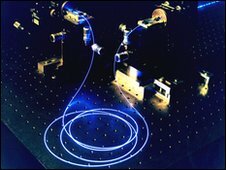 Most of that value is in lasers sold to manufacturing outlets for use in material processing, but the two other key markets are lasers for use in communications systems and in data storage. But as much as lasers have infiltrated our everyday world, there is still much more they could do, scientists believe. There is hope lasers could provide us with a near-limitless supply of clean power. In the US, the National Ignition Facility will soon train 192 giant laser beams on a tiny pellet of hydrogen fuel in an attempt to fuse the element to make helium, and so release a colossal amount of energy - much like the Sun does at its core. In Europe, researchers want to take this approach forward in a project known as HiPER that would be the prototype power station of the future. "It's possible to use lasers to crush and heat material to temperatures that are 10 times hotter than at the centre of the Sun," says Dr Kate Lancaster from the UK's Central Laser Facility in Didcot. "A standard laser pointer is about a milliwatt; we'll be approaching a petawatt - 10 million million times more powerful than a standard lightbulb. "Fusion would be immensely efficient but it's extremely hard to do. Ever since Maiman demonstrated his laser, however, people have realised that this technique should be possible." 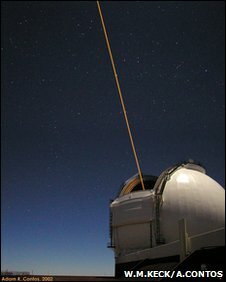 In astronomy, lasers are already used to sharpen the images of the world's very best telescopes. By projecting a "reference star" on the sky, scientists can work out how to correct their observations for the distortions introduced by atmospheric turbulence. But lasers are also pioneering a completely new form of astronomy, one that attempts to probe the Universe without the need to detect light. These laser interferometers would measure the disturbances in the very fabric of space-time generated every time massive stars imploded. Such gravitational waves are extremely weak, however, and only lasers have the precision to measure their passing. If the technique works, it should be possible to see remnant gravitational radiation from the very moment of creation itself. And in medicine, too, the possibilities seem boundless. Lasers can be used to manipulate atoms and molecules, "to unfold proteins and tickle DNA", says Dr Lancaster. "Lasers can accelerate particles to high energy and we can use that to treat cancer," she adds. "At the moment, with the way we treat cancer with radiation, photons travel into the body and they deposit energy in healthy tissue as well as at the cancer site. "Whereas when protons and ions travel into the body, they will deposit most of their energy only at the very end of their range. So we can use lasers to tune protons to deposit their energy just within the tumour site." As lasers have got ever more powerful, their pulse rate has also pushed new boundaries. We already have lasers that trace time at the femtosecond level - a thousandth of a millionth of a millionth of a second. Researchers now are also working on attosecond lasers, which count time in divisions of a millionth of a millionth of a millionth of a second. Working at these scales, it is possible to see how matter works, to record for example the moment chemical reactions occur. "On the femtosecond timescale, the atoms in a molecule will vibrate. So that is the relevant timescale for taking a detailed look at what is going on - as it happens - in a molecule," Professor Hanna told BBC News. Divide that tiny time by 10 - a reduction of an "order of magnitude", as it is known - three times over, and science can now speak of what happens in attoseconds. This, Professor Hanna explained, is the timescale of processes inside the very atoms that make up molecules. "Every time we pick up an extra order of magnitude - and there are many more to be got - we need to go back to the drawing board and think 'what on Earth do we do with that?'."